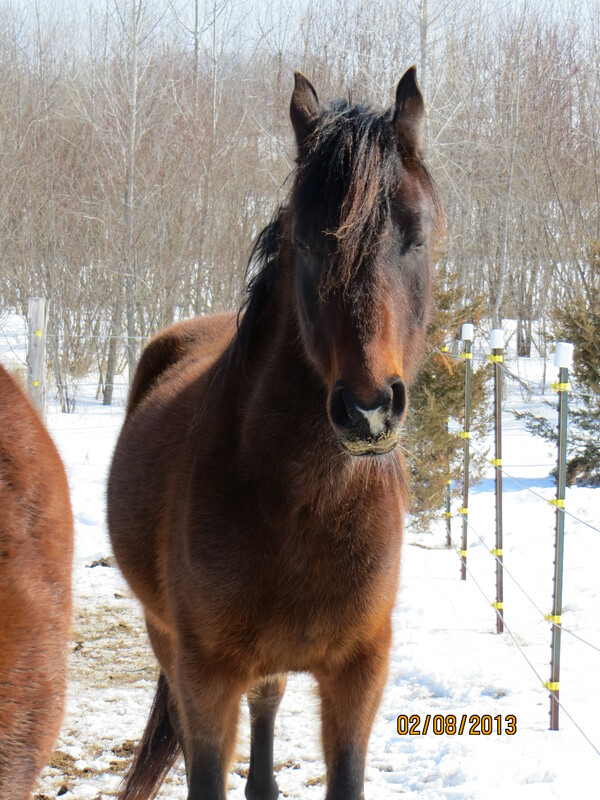 This young mare has a bouncy personality that that is in proportion to her bouncy step. Isabel is a social, inquisitive girl. Put to trot, I can envision her in the Dressage ring. She had an amazing trot that makes her a looker. She was bred to have great attributes. Then, her mom was stolen and sold to slaughter while pregnant with Isabel. Fortunately, a local sheriff was tipped off and was able to not only get the horses back and relocated to a safe place. I met her at the age of 2 weeks. She has been handled since birth and kept with her mom. She is confident in being a horse and accepting of training. I believe her Horsanality to be a RBE. She is currently being trained to accept a saddle and to trailer load. She has received the natural barefoot trim in order to use the entire sole of her hoof rather than just the hoof wall. This gives her great stability. Justice is the one that caught my attention which eventually lead to the beginning of Firefly Acres Horse Farm. I named her this because I felt that she had a bad break in life and was in need of justice. At a year old, she was the prettiest horse I had ever seen. General Information: Born in 2008, Russian Arabian, mare. She is full of curiosity and play. She is now halter trained and in Level 2 of Parelli Training; and her horsenality is LBE. She is gorgeous in the light of a sunset. She practically glows. Background: She was taken from her mother at an extremely early age. Prior to 2009, had not been trained, or named, and was fearful of people. At the time I met her, she and her two brothers (Spartan & Sebastian) were court ordered to a ‘safe barn’ for protection from abuse/neglect/starvation, pending ownership dispute charges. This little guy is only the size of a pony and cute as can be – one of everyone’s favorites. What Sebastian lacks in stature, he makes up with personality. General Information: Born in 2008, Russian Arabian, gelding. He is a brother to Justice and Spartan. He is in Level 2 of Parelli training for Liberty/Freestyle Riding and Level 3 for On Line. His horsenality is LBE like his sister. He likes to jump and play. Background: He was taken from his mother at three days, never trained or named. Prior to 2009, had not been trained, or named, and was fearful of people. At the time I met him, along with his brother and sister (Justice & Spartan), they had been court ordered to a ‘safe barn’ for protection from abuse/neglect/starvation, pending ownership dispute charges. Spartan, named my grandson, because he’s tough, started out very fearful. He didn’t like anyone near his back end and wore a halter with a catch rope attached. This was the only way his owners could catch him. Unfortunately, he started to out-grow it. With the help of someone more experienced than I was at the time, we got the halter off in time before it cut into his skin. It left marks for a long time, but is fine now. I still have the halter and catch rope as a reminder of his freedom. He is loyal and friendly. General Information: Born in 2008, Russian Arabian gelding. He is a brother to Justice and Sebastian. He is now halter trained and in Level 2 of Parelli Training. He likes to race his brother. Background: Spartan had been bred, taken from his mother at an extremely early age and never even named. 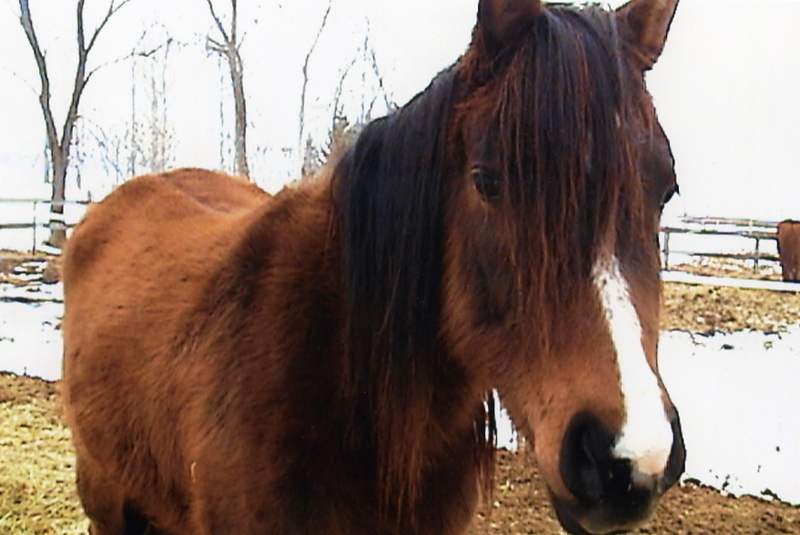 At the time I met him, along with his brother and sister (Spartan & Justice), they were court ordered to a ‘safe barn’ for protection from abuse/neglect/starvation, pending ownership dispute charges. Prior to 2009, had not been trained or even named and was fearful of people. She’s a quiet, gentle, shy girl learning to have confidence and is coming out of her shell. Permanent Resident. Background: Tina caught my eye because she had something in hers. As I was working with the younger three horses (above), I noticed what ended up being a piece of hay in her mane irritating her eye and causing a problem. I later found out she has allergies. It took me 1 & 1/2 hours to get it out of her eye due to her head shyness and lack of trust in humans. That ended up becoming our bond. Today she is one of people’s favorites. She is very quiet and sweet. We are ready to start her under saddle. General Information: Tina is a Pintabian (Pinto/Arabian cross) of uncertain age. She was a brood mare from her last two owners. Scottie was born and raised for his first 7 years on an Amish farm. He is a driving horse and gives us cart and sleigh rides year round. His owners sold him because “He got sore feet if he went 10 miles”. He wore shoes for 5 yrs straight with no rest. We removed his shoes forever and gave him a Barefoot Trim and treated his severe thrush. His feet and sound and healthy now. He has gotten used to being petted, talked to, and hand fed, and learned to return affection. He’s our quiet giant. Permanent Resident. He is 1/2 Quarter Horse, 1/16 Morgan, and the rest is Draft and Pinto. Carson is a favorite among those who come here. He helps deliver the hay when the terrain is muddy or hard to walk on, by allowing me to hold onto his tail, then picks the spots where he knows are the best places to put the hay. Information and pictures coming soon.